Welcome to part three of the Change series… as stated in the last lesson, each week, I will leave you with a nugget from the lessons and may it help you. FOCUSED stands for: Faithful – Occupy – Commitment – Unified – Steadfast –Encouraged and Determined. This alone should help you understand how we must be so that we can live for Christ as He has called us to be. This lesson we shall speak on Occupy. . .
Luke 19:12-13 (KJV) - He said therefore, A certain nobleman went into a far country to receive for himself a kingdom, and to return. And he called his ten servants, and delivered them ten pounds, and said unto them, Occupy till I come. The word occupy means to take or fill up space/time, to engage or employ the mind, energy, or attention, to be a resident or tenant of, to take possession/control, and to hold a position/office. When we look at this word, and see what it means and then relate it to our lives and walk in Christ. Jesus returned to prepare a place for us and we are to occupy until He returns. This means that we are to be busy doing His will. To be busy doing His will and occupying until His return, we are able to remain focused in our walk with the Lord. What does it mean to occupy to a Christ, what does He really expect us to do? He expects us to do just as He says, He expects us to occupy our time doing HIS will, not our will – following His direction not our direction. He has called us to a different place in Him, He has called us to occupy – what are you doing to occupy? When you are occupying yourself until His return, you will see that your life is more focused on the things it should be, you will find that you feel more faithful to the Lord and able to stand against the things of this world. Next time a nugget on Commitment!! I know I need to occupy myself by reading the Bible more so I can get a better understanding and knowledge of where God is leading me. Once I occupy myself and focus more on him he will give me more knowledge and understanding of his words. 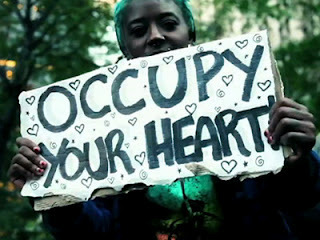 By occupying myself I truly believe in my heart a change is gonna come. I know God has a plan for my life but I have not quite figured out my purpose as yet, I just feel a bit confused not knowing my purpose as yet. I pray one day it will be revealed to me when it's time. So I can occupy. Truly we need to occupy our time more wisely by focusing on prayer, mediating on God's word, and bearing good fruit so others can see the Christ in us. So when Jesus returns we'll be ready for him to welcome us into his Kingdom! Join in and write your own page! It's easy to do. How? Simply click here to return to Alissa Griffith's Entry Form.